You’ve been coughing and sneezing for what seems like forever! Well, if your symptoms include a fever, sore throat, runny or stuffy nose, body aches, headaches, chills, fatigue and sometimes, diarrhoea and vomiting… then you should stay home and avoid contact with other people. 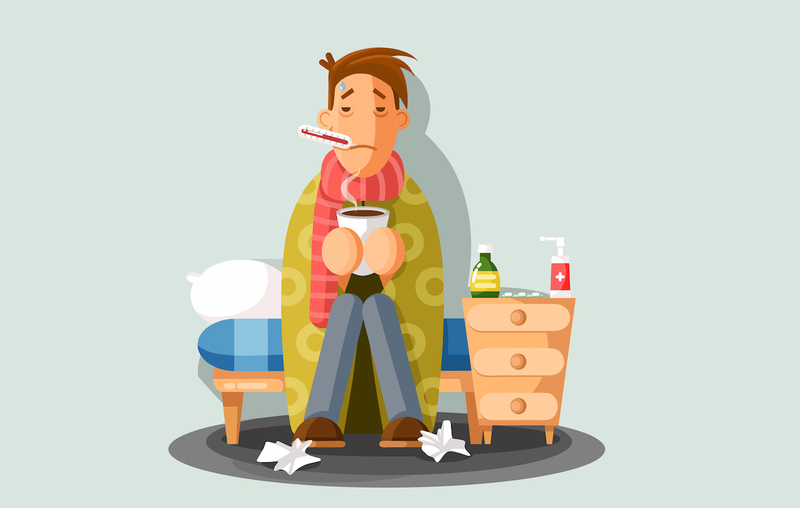 Unlike a common cold, the effects of an influenza virus can come on very quickly. Flu symptoms usually start within one to four days after the infection. Flu often has signs of fever or chills. A headache, sore throat, dry cough, runny nose, muscle aches, and fatigue follow after. As the infection progresses, you may have warm and flushed skin, bloodshot or watery eyes, a severe cough with phlegm, and nasal congestion. Children may experience nausea and vomiting. If you’re infected with influenza you may be contagious from one day before symptoms start until five to seven days after becoming sick. Children may continue to be contagious for longer than seven days. Stay at home until the contagious period has passed. This will help you avoid passing germs and picking up a virus from others. Cold is spread by a virus that can stay alive on different surfaces. So, make sure the areas in your home are clean as far as possible. You can easily catch the cold from someone who has it, so if you notice someone coughing and sneezing excessively, avoid them! Use a tissue when you sneeze. Turn your head away from others when you cough or sneeze. Bring up your elbow and cough or sneeze into your sleeve. To help get rid of a common cold, take a hot shower. The steam from the shower can help clear your sinuses and respiratory passages. When you’re in the shower, gently blow your nose to help get some of the mucous out of your passages. Don’t shower too long though, you may get dehydrated. If your symptoms last longer than 10 days and start to get worse, see a doctor. With flu, prevention is key. Get a flu injection to reduce your chances of catching the flu. If you do catch the flu, act quickly and get the right medication from your doctor. Add lots of fruit and vegetables to your diet, exercise regularly and get enough sleep to keep your immune system in shape to battle the flu. Remember; always wash your hands after shaking hands with people or touching communal bathroom door handles and lift knobs. Sleep and get plenty of rest, your immune system needs a lot of sleep to recover. Treat your cough so you can rest easier. If your fever comes with a severe headache, throat swelling, unusual skin rash, mental confusion, and vomiting for more than three days, be sure to see a doctor.